Last Friday brought the launch of the new Autumn Winter collection at Simply Be and also the latest collaboration with Look Magazine for their second collection together. I'm going to be sharing my favourite picks from the collection and here is a video with all the different pieces, so watch that for a full overview before skipping to the bits I've picked. 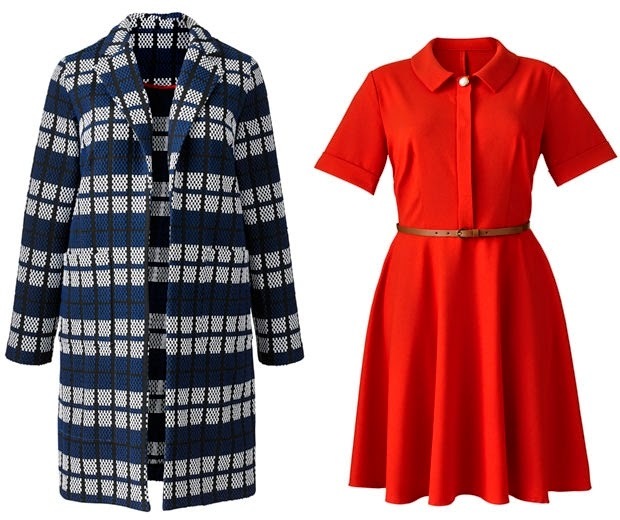 My first picks are the Grid Design Check Coat and Shirt Style Belted Dress. The coat is such a bit of me, it's a great length, checked and where it's unlined I would layer it over a jumper with white shirt underneath and skinny jeans combo. The dress strikes me as quite Marsha Brady with the vintage cut and design, it's very sixties which is a big trend for this Autumn/Winter. I'm going to be doing a separate blog post with a full trend forecast so keep an eye out for that! Next I have the Grid Design Top and Printed Long Sleeve Shirt. The checked top is perfect for a matchy-matchy look with the coat above but would also look great on it's own paired with black skinny jeans. The sleeves are a good length too which is definitely something I appreciate! The shirt is a very cool print, I would wear it over a black cami (as it's a bit sheer) and tucked into a black skater skirt for work. Finally here are my two favourite pieces from the entire collection, the Mesh Trim Dress and the Grid Design Mesh Dress. Where do I begin on the first one, I love the lace arms, the lace panels at the bottom of the skirt, and the shape is just so feminine and pretty. It's a nice twist to a classic LBD and something I would wear day or night and on a regular basis. I need it in my life! The second dress ticks pretty much the same boxes for me, long sleeves with grid instead of lace detailing, a similar shape but with a lower scooped neckline and a the gridded mesh at the bottom of the skirt. The electric blue is very eye catching and the dress is a nice statement piece for day with flats or night with heels. I am personally loving the collection, but don't take my word for it, check it out yourselves here and leave your thoughts in the comments below! Oh, my favorites are definitely the red and black dresses! They have such retro-inspired designs that I love.